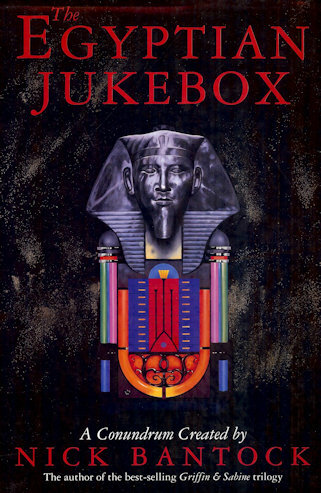 The Egyptian Jukebox by Nick Bantock is a dark and intriguing conundrum. The book asks a single question: “Where do my worlds join?”. The answer can be discovered in the 10 Drawers that make up the book. This is Part 2 of my solution to the Egyptian Jukebox. Part 1 is here and provides some hints to get you started before going into the full explanation of the puzzle methodology and the solutions for the first 5 Drawers. This part will give a brief recap of how the puzzle works before giving the solutions for the last 5 drawers and fitting them together for the final answer. If you want to avoid spoilers as much as possible and just want a few hints, stop reading this post now and go read Part 1. The Clue page for each Drawer has a picture of one of 10 Egyptian Gods on it. The names of these gods are all listed in the inscription page at the start of the book. The letters of the God’s name should be written, from top to bottom, on the black marks along the left edge of the Drawer. Each Clue page then lists one or more line (Ln) and word (Wd) numbers from the story for that Drawer. Plucking the indicated words out of the story gives the title of a song. The date is the date on which that song reached number 1 in the US. The letters of the song are written, from left to right, on the black marks along the top edge of the Drawer. These letters create a grid in each Drawer and are referred to several times in the navigation instructions on each Clue page. Following these cryptic instructions takes you on a tour around the Drawer, finishing up by identifying a single letter. This single letter is the solution for the Drawer. The Clue page also tells you the order of the solution letters in the final answer. In Drawer 6 the God is “AMON”, the ram. The golden song is “BLACK AND WHITE” which was a US no. 1 hit for Three Dog Night on 16 September 1972. The letters “AMON” are placed in the 4 black marks down the left side of the Drawer. The letters “BLACKANDWHITE” are placed in the black marks across the top of the Drawer. Following the navigation instructions on the Clue page, the chess board at the top right of the drawer is set up so that the black pawn can take the white pawn. That white pawn is labelled as item 21, “Queen’s pawn on QP3” on the Clue page map. The “Fallen King”, or “Dead Monarch” is labelled as item 18. 21 minus 18 equals 3. There are six “cast figures” along the bottom of the drawer. Counting 3 across from the right, this figure is in line with the letter A from “AND” in the song title “BLACKANDWHITE”. The “pillar” is the God’s name down the left side, so the twin letter is the A of AMON. Dropping down a letter from the A takes us to the M, the second black mark. Travelling East from that mark, the first letter reached is the I of “India”, written on a scrap of paper. The first letter of the answer is “I”. In Drawer 7 the God is “HORUS”, the falcon. The golden song is “THE JOKER” which was a US no. 1 hit for the Steve Miller Band on 12 January 1974. Following the navigation instructions “Death’s pointed tip” is the arrowhead pointed at by the skeleton, item 19. Travelling back along the shaft of the arrow (item 1) one of Mephisto’s (item 15) horns crosses over it. North East from this point is a Peacock’s Eye (item 17). The “H from the song” is the second black mark along the top edge of the Drawer. Moving West from the Eye to the “spot below H” takes you to a point near the red stamp in the top left corner of the Drawer. Drawing a diagonal line from there through Mephisto (item 15) points to another stamp, the “bordered head” near the bottom right corner. Straight up from that stamp is a number 18 in a red circle. 3 squared times 2 equals 18, so this is the correct number. The letter above the number is I. The ninth letter of the answer is “I”. In Drawer 8 the God is “SET”, the crocodile. The golden song is “MACK THE KNIFE” which was a US no. 1 hit for Bobby Darin on 5 October 1959. Following the navigation instructions “M’s opener” is item 23 at the right of the Drawer. The “Circle at the tip” is the coin, item 24, just below. That coin is above the “Black and red ruler”, item 19. The 4″ mark on the ruler is in line with the letter N of “MACKTHEKNIFE”. There are two labels with the letter N on them in the Drawer. One has the number 37 on it, near the top middle, the other has the number 33 on it, near the bottom middle. The remaining “B#s” (item 9) are numbered 23 and 17. The “closest to hand” is an awful pun and means the number 17 next to “David’s plaster hand”, item 16. Adding together the digits of 17 gives 8. Item 8 is a “space compass”. If you take away the number (8) and the direction finder (compass), you are left with the word “space”. Thanks to S. Roger in the comments below for suggesting this solution, which is far more plauible than my idea that 8 minus 8 equals 0, or “nothing”. From this, the third letter of the answer is a “space” between two words. In Drawer 9 the God is “PTAH”, the magician. The golden song is “BLUE VELVET” which was a US no. 1 hit for Bobby Vinton on 21 September 1963. What number is the time? This is the only set of navigation instructions that I have never solved to my satisfaction. The complex sum should, I believe, give the answer “3”, but I have found no way of reaching that answer. “The sum of the time and the ball, deducted from the sum of the case file digits plus the stocking clip # minue the boot ear studs # gives the # of unwanted letters in the God’s name”. The only object that might be “the time” is a chronometer. 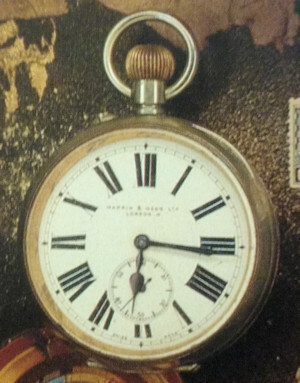 This is item 3 and the watch reads 6:16 (hands pointing at 6 and 3) and 37 seconds. The only ball is a pool ball with the number 9 on it. This is item 15. The case file number is item 18 and the number written on it is 583556. The stocking clip is item 13 and the boot ear studs are item 12. Best of luck working out a sum from all that lot that gives the answer 3! The answer 3 has to be three because this means that there are 3 letters in the name “PTAH” that are unwanted. These unwanted letters are “TAH”, which is “HAT” spelt backwards, or “headgear worn the wrong way round”. The remaining letter is P.
The seventh letter of the answer is “P”. In Drawer 10 the God is “TAUERET”, the hippo. The golden song is “HEART OF GLASS” which was a US no. 1 hit for Blondie on 28 April 1979. Following the navigation instructions, the “Singing Soldier” is second “metal revolutionary”, item 7, from the right: the one with a microphone in his hand. The “aquatic equus” is the seahorse, item 21. Between them is the head of the “Broken tail creature”, item 22. This is next to one end of the bowed blade of the “Scarlet sickle”, item 13. Following the curve of the blade, the “cycloptic snake” is the single die with a number 1 on it, item 11. The “Soviet observer” is “Lenin’s eye”, item 16. A line from the die through the eye takes leads to the second letter A in the song title, “HEARTOFGLASS” along the top edge of the drawer. “The morning” is “AM”, so taking A away from AM leaves the letter M.
The sixth letter of the answer is “M”. 10. Sixth letter is M.
Putting these together gives the final answer to the question “Where do my worlds join?”: IN MEMPHIS. I hope you had fun taking this journey about the Drawers of the Egyptian Jukebox with me! Thanks for this! Consistent with other (solutionless) commentary on the web, the puzzle book is fairly easy and straightforward once you figure the pattern for the first page. My big hangup was not being able to figure the songs out. I didn’t get the significance of the dates, and thought that Wd and Ln stood for ‘width’ and ‘length’ on the drawer grid — obviously mistaken there. Well done! Drawer 8’s solution is actually to start with the text “8 Space Compass”, remove the calculated number (“8”), and the direction finder (“compass”), leaving the word “space”, meaning the third character of the solution is a space. This also explains the name “space compass” which makes no sense otherwise. The author does this kind of thing on other drawers (“sea tree”?) so I’m pretty sure this is the intended solution. For drawer 6 I found an amusing alternate way to reach the “I” answer. Taking the line “head E into the drawer until you reach the initial letter”, if you head east you intersect the fountain pen (the “drawer”) and right behind it is a written paper letter (the “initial letter”). The letter intersects the “I” from WHITE, the answer. The last bit is kind of ambiguous so I doubt this is the real solution. But it always bugged me that the “India” solution relies on something not in the item list so I was happy to find it. I also was stumped on how to get 3 out of the numbers in drawer 9. I’d love to hear what the intended solution was there. One thing to add is that “6:16” is actually “18:16” in many countries so that gives you an 18 to play with. I couldn’t make anything out of it though. Your “space compass” answer for drawer 8 seems far more plausible, thank you. I’ll update the solution.